1. Browze our templates and choose the style and tract template you want. Note the price includes printing, any appropriate set up cost. 3. Go to the Information Form page and fill out all appropriate information for us to place on the tract. This information depends on what tract template you chose. 4. After you submit the Information Form, we will send you a proof of the tract with your information on it. 5. Please carefully review the proof to make sure everything is correct. 6. If the proof is correct please reply to the proof email granting approval to print, and the UPS shipping address you want the tracts to ship to. 7. If there is a mistake on the proof, send the correction and we will fix it and send you a new proof. Note: We will NOT print without customer final approval and a valid UPS shipping address. 1. Compile any church or ministry information you want on the tract. This would include things such as Church name, address, phone, fax, web site, e-mail, etc. 2. Consider folding options: single fold, or double fold. 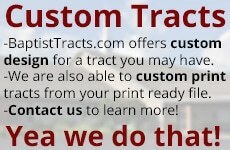 We offer single and double fold tracts. The type of tract you choose will normally depend on how much information you are wanting to place in the tract. 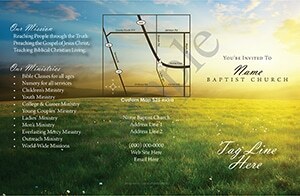 At BaptistTracts.org we have three standard tract sizes. For our single fold the closed size is 3 1/8 x 4 7/8. We have two double fold tracts. Style 1 closed is 2 7/8 x 4 1/4, and Style 2 closed is 2 7/8 x 5 1/2. 4. Compile ideas you want on the tract. This may include, but is not limited to: description of ministry, directions to church, times of services, any contact information, etc. 5. Compile any custom images for the tract. For any pictures you want on the project, please provide a high resolution picture for best quality. This would be around 2000 x 2000 pixel dimension which is roughly equivalent to a 4 or 5 megapixel picture. 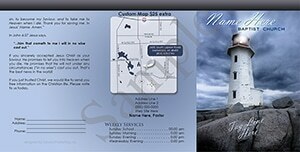 We use stock photos for most of our tract design. 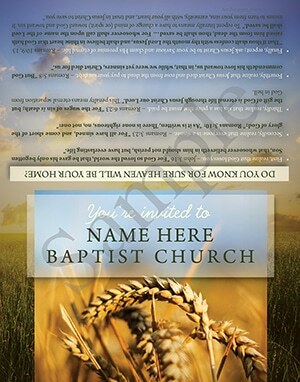 However if you wanted to use a picture of your Church, we can incorporate it into the design. 6. Suggest a color scheme or theme. If you have any particular colors that your Church uses in other printed materials, it would be best to let us know so we can try to make them look consistent. 7. Submit the information and pay for the custom tract design below. 8. We will start the design process and have a proof you you in 1-2 weeks. You will be able to make any changes until the tract looks the way you like it. 9. 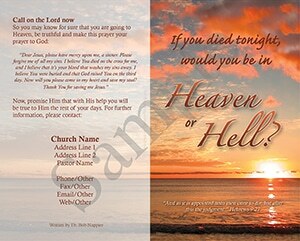 You will need to approve the final tract, qty of tracts to be printed and a valid UPS shipping address. 10. We will print, ship and invoice you for the tracts.